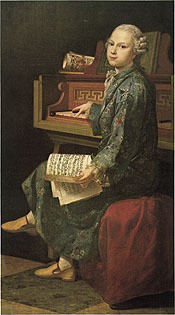 The boy, wearing a Chinese coat, is touching the keyboard with one hand while thoughtfully examining the music opened on his lap. Little wonder people have attempted to claim that this is Mozart, even though there is absolutely no connection between him and the boy in this portrait. Oil Painting by Jean-Baptiste Perroneau, 1767. Original owned by Musée du Louvre.